The Jackson family continues to air its troubles in public, but the dispute has left many, including estate executors, worried. Turmoil in Michael Jackson's family continued Tuesday as a family feud that has engulfed the singer's mother and children continued to play out in online posts, on national television and in a videotaped driveway confrontation that authorities continue to investigate. By day's end, Randy Jackson accused Branca and McClain of criminal misconduct and claimed his brother's 2002 will was a fake. "They know that they've been caught, they know that they've falsified a document and they know that there are questions that we want answered," Randy Jackson told the Rev. Al Sharpton on Sharpton's MSNBC show. "This family is united to right a wrong." He accused the estate of trying to keep the family's disagreements at the forefront to deflect attention away from questions about the will. Jackson's estate has denied all claims of wrongdoing, calling questions about the will and allegations against the executors "false and defamatory accusations." The executors hinted that further action may be taken to protect the singer's children. "We believe measures are being put in place that will help protect them from what they are having to deal with," Branca and McClain wrote. Michael Jackson's only daughter, Paris, has posted updates in recent days on Twitter, including her displeasure with not being allowed to speak with her grandmother for more than a week. On Tuesday, she wrote, "9 days and counting... so help me god I will make whoever did this pay." Katherine Jackson was reported missing over the weekend but later found to be with her daughter Rebbie and other relatives in Arizona. She has not spoken to her grandchildren — Prince, Paris and Blanket — since leaving the Los Angeles area July 15. Jackson brothers Jackie, Marlon and Tito appeared on "The Insider" Tuesday and said they also have not spoken with their mother in a week and said that was unusual. Sheriff's spokesman Steve Whitmore said deputies continue to investigate the altercation that took place Monday afternoon, but he said there were no indications it involved the singer's children. He said the incident involved two adult males but declined to identify them further. A battery case may be presented to prosecutors, but Whitmore added that decision has not yet been made. Randy Jackson said he and brother Jermaine and sister Janet went to the home in Calabasas on Monday to invite his brother's older children, Prince and Paris, to join their grandmother in Arizona. Security footage of the incident was obtained by "Good Morning America" and celebrity website TMZ. 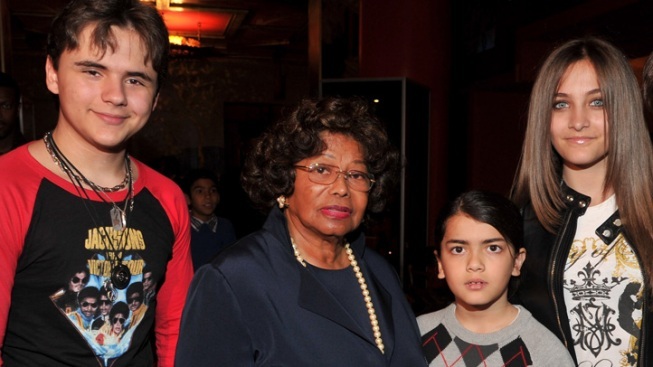 Whitmore said the missing person's investigation into Katherine Jackson's whereabouts has been closed, as was an inquiry about possible elder abuse of the 82-year-old Jackson family matriarch. The singer died with more than $500 million in debt. Janet, Jermaine and Randy Jackson were joined by siblings Tito and Rebbie in a letter leaked last week, calling on Branca and McClain to resign and accusing them of manipulating their mother. The letter also claims that Jackson's will is invalid.